Our Dive Day Trips out of South Bali generally include pick up and and return transport from your hotel or airport at any location on Bali island, also transfer to the booked dive sites (with boat or car), 2 dives, tanks, weights and weight belt and dive master or dive instructor, lunch and non-alcoholic beverages, all fees and taxes are included too. Package price on day trip base: Our prices for day trips are made up of 2 prices. The actual dive package and a transport package for each dive site. The dive package includes tank weight and dive guide. Daily excursions include 2 dives per day. The “Transfer Package” includes all transfers (on land and water) from the hotel to the dive sites and back. All entrance fees and tickets, lunch and soft drinks! 1 dive package with 2 dives 55 Euro + 1 transport package Tulamben 30 Euro = Total 85 Euro (…plus rental equipment 15 Euro per day if needed!). 1 dive package with 6 dives 167 Euro + 1 transport package to Tulamben 30 Euro, 1 transport package to Blue Lagoon 35 Euro and 1 transport package to Manta Point 75 Euro = Total 295 Euro. (…plus rental equipment 15 Euro per day if needed!). Please download our General Resort Information and Rates for the season 1.05.2019 till 30.4.2020! Bali Dive & Snorkel Site “Tulamben WWII Ship Wreck” – one of our most recommended dive sites! Nusa Penida & Lembongan, Ceningan because of the present current these are typical dive site and therefore not suitable for snorkeling or discover scuba diving. By outrigger boat, the islands can be reached within 50 minutes and sometimes the sea may be a bit rough. 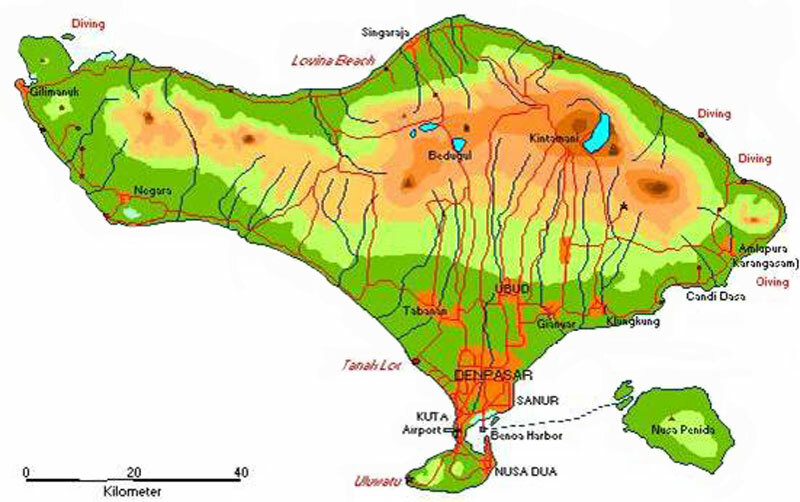 The reef characteristics are the same for both islands with the exception that Penida’s reef drops steeper than the Lembongan reef. The visibility reaches usually 20 meters or more. Sometimes thermo clines cause sudden drops in water temperature. Because of the conditions here, coral grow faster than on any other reef. Large schools of Basslets circle the reef and quite often you will find the wonderful egg cowries as well as high whip coral. Big fish encounters featuring manta rays, eagle rays, sharks, giant turtles and sunfish are common and therefore you may always keep one eye away from the reef, scanning the endless blue. These islands are a must for the experienced and demanding diver. Currents may become very strong and changes direction from time to time – thus, advanced diving experience is a prerequisite! All dives are drift dives, with boats following the divers. Highlights: amazing scope of swarm fish, excellent visibility, big fish encounters common! Gili Biaha / Lipha.We will leave the harbor of Padangbai with destination Candidasa. After a 30 minute boat trip by our 12 m long speed boat, we will arrive at Gili Biaha, a rock in the open sea. On the open sea side of this rock, a slope drops to a depth to deep for divers to exploe. The slope is covered with beautiful stone- and soft coral, which remain small but sturdy because of the permanently present current. Because of the rock’s exposed position facing the open sea it offers a fair chance for big fish encounters including Grey – and White Tip Reef Sharks which most times can be observed while asleep in a cave. The rock side facing the beach drops in a 45 degree angle into a depth of 60 meters plus. Here you may find nurse sharks and black-banded sea snakes. Both dives are drift dives with an attentive boat crew following the divers. Because of it’s exposed position in the open sea and occasionally strong currents, Biaha is an outstanding dive site for experienced divers only. Unfortunately this great dive site is not suitable for snorkeling. The Blue Lagoon is situated near Padang Bai’s harbor only 5 boat minutes away. We will be diving both lagoons at either side of the harbor. The southern part of the reef drops vertically to 20 m and continues in a sandy area. The drop off is covered by stone- and soft coral. Many Nudi Branches and some flatworms can be found here. The underwater landscape is dominated by up to 4 m high growing soft coral where large spiny lobsters can be found. When reaching the open water large schools of bat fish accompany the divers. On the northern side the dive starts in 3 to 5 m deep water. Either we will explore an interesting slope which drops to 30 m featuring plenty of ‘fan’ worms and feather stars, or we dive the sandy area while drifting between beautiful soft coral piles. At short distance a large stag horn coral field stretches 8 m of depth, accommodating oriental Sweet Lips, Basslets and schools of Glass Fish. Finally, the sandy area is replaced by stone coral fields. At the outer reef border, the current increases in strength, attracting White Tip Reef Sharks, hunting for prey. The Blue Lagoon is actually a perfect spot to start your diving trip in Bali. The relaxed environment supports rusty divers who need to get used to diving again and who need a chance for buoyancy and equipment checks. Furthermore, the lagoon is an excellent site for snorkeling, discover scuba diving, swimming and sunbathing. Manta Point One of the most popular dive sites of Bali is located on the South side of Nusa Penida and is one of the few dive sites in the world where you can meet relatively safe Manta Rays (Manta Birostris). The crossing from Padang Bay to Nusa Penida with the dive boat takes about 1 hour. In windy conditions the sea can get a little rough and extend the trip a bit. The dive site is situated in a small bay. It’s protected by a large rock from the main current. Therefore hardly any current is present. Due to the location Manta Point is, however, freely accessible for the waves and we might have to expect mild to heavy swell. Most of the dive is spent at about 10 meters or shallower, so we are definitely affected by the possible swell. As you descend about 100 meters from the shore one can find a relatively flat expanse of sand at 12 – 14 meters before it rises slightly towards the shore. Near the shore are scattered large boulders, which one of them was chosen by the Manta Rays as their cleaning station. Here in Bali Manta Rays are not seasonal and can be found at the cleaning station with high probability. In the event that you have some time to bridge till the Mantas appear, one can while away the time by observing a collection of the usual colorful reef fish, blue spotted stingrays and the occasional nurse shark. Arrival time: ~ 17:00 p.m.
Shark Point at Gili Mimpang – The current attracts White-Tip Reef Sharks to this location. Gili Mimpang is a nice rich covered reef with the right angle to the main current, which effects having a relatively strong up-current combined with a strong down current on the opposite side of the reef. The chance of meeting sharks on this spot is more than 90%. Both dives are outstanding dive sites for experienced divers only. Unfortunately this great trip is not a good place for snorkeling. Bali Dive & Snorkel Sites “Menjangan Island” – one of our most recommended dive sites! Nusa Menjangan is a 1,5 km long and 500 m wide island in the West Bali National Park. The Indonesian government has limited the daily allowance for divers. All dive sites around the island are only a short boat trip from each other away. Except for the western part of the island coral growth starts in shallow water, stretching out for about 20 to 30 meters before suddenly dropping vertically to a depth of 30 meters. The western end of the island features a deep lagoon with a reef slope of 45 degrees. Currents at Nusa Menjangan are weak to moderate with the strongest currents present at the western lagoon. Therefore Menjangan is a perfect spot for beginners. Because of the beautifully grown lagoon, it is also an outstanding spot for snorkeling. Menjangan’s underwater world surely deserve to be listed as one of the world’s top dive sites. The result of a coral count (carried out by diving pioneer Jacques-Yves Cousteau) stated that on this small island alone features more coral species than the whole Caribbean!